Members of the Omohundro Institute’s Board of Directors determine matters of policy and have responsibility for the financial and general management and for resource development of the OI. The Board of Directors consists of six members: four elected by the Board and two ex officio members (the chief academic officer of William & Mary and the chair of the OI Council). Members of the Council are typically drawn from the academic community. 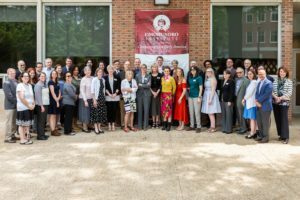 Councilors advise the OI executive director and the Board of Directors on policy, programmatic, and professional matters of concern to the OI and serve on one of the Council’s three standing committees: the William and Mary Quarterly Editorial Board, the Book Publications Committee, or the Conference Committee. OI Associates are annually invited to submit nominations for consideration by the Council. Click here to read the formal request.